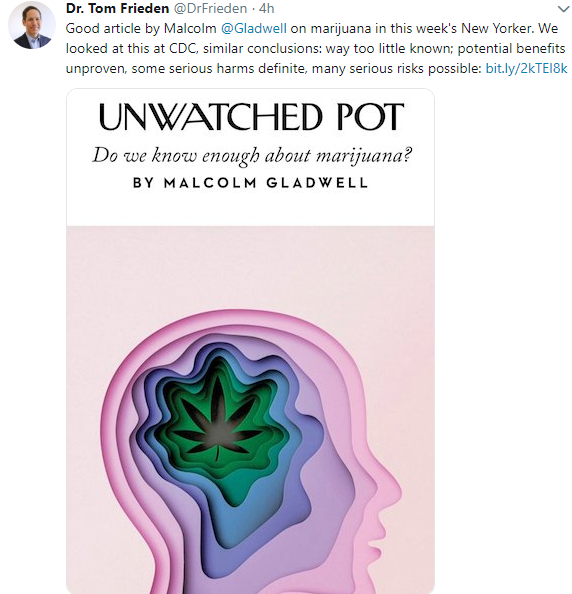 A recent link to Malcolm Gladwell’s article in the New Yorker: Is Marijuana as Safe as We Think? One of my sons informed me of this article. Does cannabis serve as a gateway drug? Like e-cigarettes, cannabis is being formulated into products attractive to youth: gummy bears, bites, and brownies. My take (borrowed in part from author): “Permitting pot is one thing; promoting its use is another.” We really don’t know that much about marijuana. This entry was posted in General Health and tagged cannabis, marijuana by gutsandgrowth. Bookmark the permalink.